A tale of horror and hope in an apocalyptic world. A man and woman, bound together by a moment of guilt, carve an existence in a broken world. They are physically unaffected by the horrors of the death of civilization --the death of the world slid off them like ash in the wind. They seem to have become immortal and have built an existence in an abandoned valley by the sea. Then something arrives, a creature like them from a world they thought deserted. He brings knowledge and embodies the fears and yearning within them. A battle begins between them, their pasts and the future. 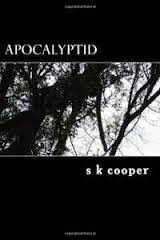 Author S K Cooper is a screenwriter and novelist. He lives and works in Sydney, Australia. Cooper’s previous novel, Chrome, a novel of cyber noir science fiction, was published in 2007. Cooper has published academic works and is currently writing screenplays for Vanguard productions.